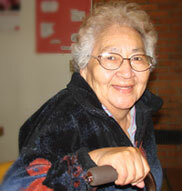 Jennie enjoys the meals and also delivers meal bags to homebound Elders. Across the reservations of the Northern Plains, Elder Nutrition Centers (ENCs) provide many Elders with free, hot lunches every day. These meals nourish the spirit as well as the body by offering Elders much-needed companionship, along with well-balanced meals. Although the ENCs often receive Federal funding, food supplies often run low by the end of the month. The staff sometimes need to cut back on food quality and portion size. The NPRA Food service helps ensure that these Native American Elders do not go hungry, by delivering truckloads of staple foods to nutrition centers and soup kitchens each month, year-round. Each NPRA Food package contains items such as 50 pounds flour, 25 pounds each of sugar and noodles, beans, and several cases of soup mix, canned vegetables, and canned fruit. Special items such as energy bars and cake mix may be added when available. Rosella is thankful for the nutritious meals. Each partner at an Elder Nutrition Center (ENC) receives one package per 100 Elders they serve. By providing these non-perishables, NPRA Food enables our nutrition partners to stretch their program budgets to feed more people or use the funding in other areas of their program. In many communities, volunteers also deliver meals from the ENCs to homebound Elders. Each winter, anticipating that the ENCs may close due to severe weather, NPRA Food provides some emergency food packages, which are distributed to Elders to have on hand during a storm. Each summer, NRPA provides fresh produce for distribution to Elders in selected communities. Additional food is provided through our Easter, Thanksgiving and Christmas services. NRPA Food also provides supplies of nonperishable food for distribution through reservation food banks.